Flower colors that contrast with their background are more important to foraging bees than patterns of colored veins on pale flowers according to new research, by Heather Whitney from the University of Cambridge in the UK, and her colleagues. Their observation of how patterns of pigmentation on flower petals influence bumblebees' behavior suggests that color veins give clues to the location of the nectar. There is little to suggest, however, that bees have an innate preference for striped flowers. The work is published online in Springer's journal, Naturwissenschaften - The Science of Nature. Very few flowers are a simple block of a single color. Patterns of pigmentation include color patterns within a petal or different colors on different petals. These patterns are thought to be important for pollination. Bees can identify, and are sometimes attracted to, patterned flowers over plain flowers. These patterns can increase the speed with which bees locate the nectar reward in a flower. Venation patterns - or lines of color on flower petals - are common in Antirrhinum flowers, commonly known as snapdragons. The authors looked at the ways in which these color veins influence bumblebee foraging behavior. They exposed bees who had not seen flowers before to veined, ivory and red types of snapdragon flowers. 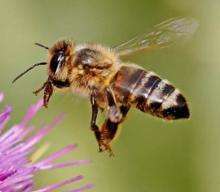 They observed whether bees could distinguish between ivory and veined flowers and which type of flower they preferred, when they were looking for nectar. From the bees' perspective, red flowers reflected little light while red veins on ivory flowers slightly changed the color of the flower. The ivory background, however, had the most effect, as it contrasted with the brown background more than the red flowers did. Bees successfully discriminated between ivory and veined flowers but showed no preference for one or the other. In contrast, both ivory and veined flowers were significantly more popular than red flowers.